GEI International, Inc. is a manufacturer of etched stainless steel products and has the ability to design and manufacture a wide variety of different products including rulers, scales, gauges, nameplates, etc. 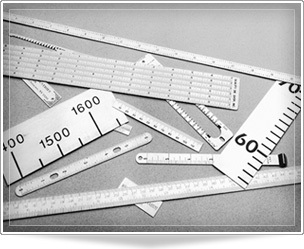 The proprietary GEI International, Inc. ruler and gauge manufacturing process is efficient and flexible and allows for the custom manufacture of special rulers, scales, gauges and other items in both small and large quantities at reasonable prices. We can produce private label and brand label products to either your or our specifications. To develop custom products we can work from ideas and sketches, detailed engineering drawings and electronic design files. Complete specifications can be developed before manufacturing to provide exactly the product that is required. We have the design expertise and manufacturing resources necessary to custom design and manufacture products to your requirements. Our dedicated engineers will ensure that you get the optimal design, while our quality program guarantees the best final products. A selection of some of the special and custom products that we have made in the past is shown in the photograph above. Special products to your or our design can be manufactured in small or large quantities at reasonable prices. All manufacturing operations from design to product completion are performed by GEI in our factory in East Syracuse, N.Y., U.S.A..
" FAX , TELEPHONE OR EMAIL YOUR REQUIREMENTS TO US FOR A QUOTATION."